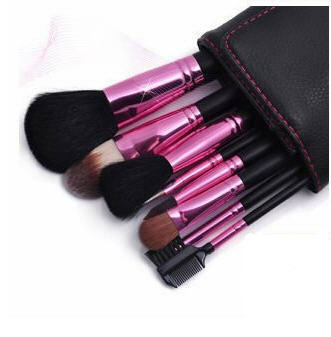 Have you ever been overwhelmed by the world of makeup brushes? With specific brushes for bronzer and a separate one for blush, fan brushes and kabuki brushes, it's hard to keep them all straight and remember what's used for what. Especially if you're just becoming interested in makeup. I'm here to tell you that it's really not all hype. Using the proper brush when applying makeup can make a world of difference in the end result. If you don't use brushes, beyond the chintzy ones that come in the packaging, I encourage you to add a few good brushes to your makeup arsenal. And if you're confused about what they're all for, Lauren Conrad and the beauties over at The Beauty Department are here to help. They've created a two part post that breaks down what each brush would best be used for and the best type of brush for a particular job. You can read Brush Class here, Brush Class, Part Deux here and the third installment which covers eye brush here. But don't forget that the quality of the brush is important too! You don't have to spend big dollars on top of the line brushes, you can find good brushes through Sonia Kashuk's line at Target and even local drugstores, like the Essence of Beauty brand at CVS.